The factory camouflage scheme was evolved to the 162B using the late period RLM 81 braunviolett (brown-violet), RLM 82 lichtgrun (light-green) and RLM 76 lichtblau (light-blue) . The fuselage and vertical tail plane were usually mottled with RLM 81 and RLM 82. However, some examples were delivered with solid colors. The fuselage could also be painted in one solid color or alternatively be mottled. National markings for the wings were often of the older style while fuselage and wing insignia were the simplified outline variety. The masking set comes in a clear zip-locked cello bag. 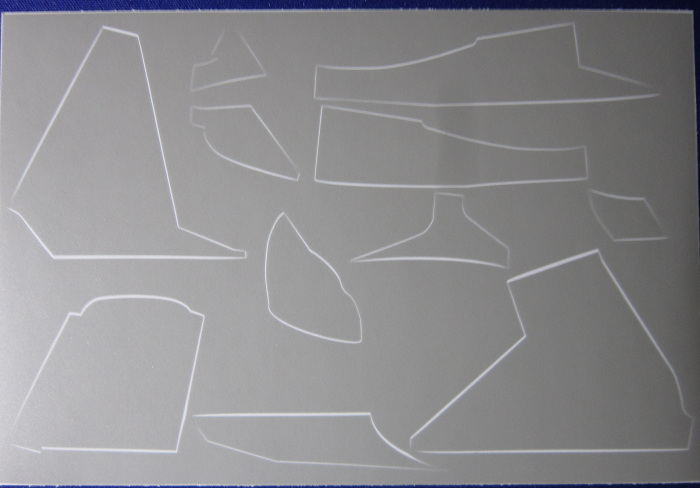 It contains the instructions, a grey vinyl die-cut sheet of self-adhering masks, with a stiff sheet and a small sheet announcing the release of masking sets for the Avro Lancaster and the Defiant. 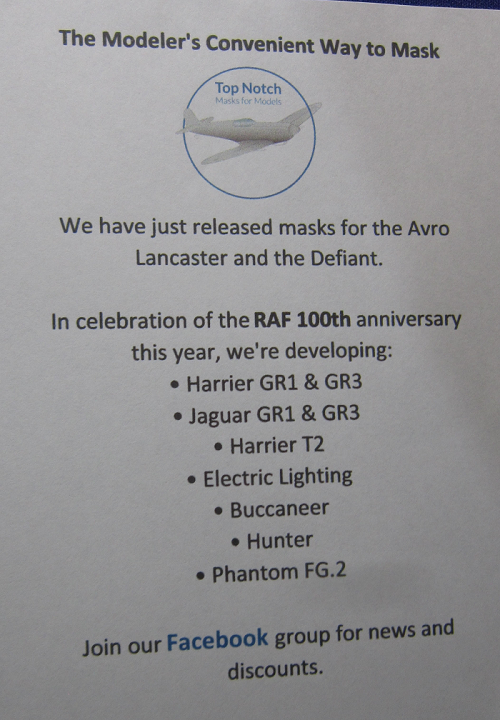 In celebration of the RAF's 100th Anniversary, Top Notch is developing masking sets for: the Harrier GR1 & GR3, the Jaguar GR1 & GR3, the Harrier T2, the Electric Lightning, the Buccaneer, the Hunter and the Phantom FG.2. Modelers are invited to Join Top Notch's Facebook group for news and discounts. 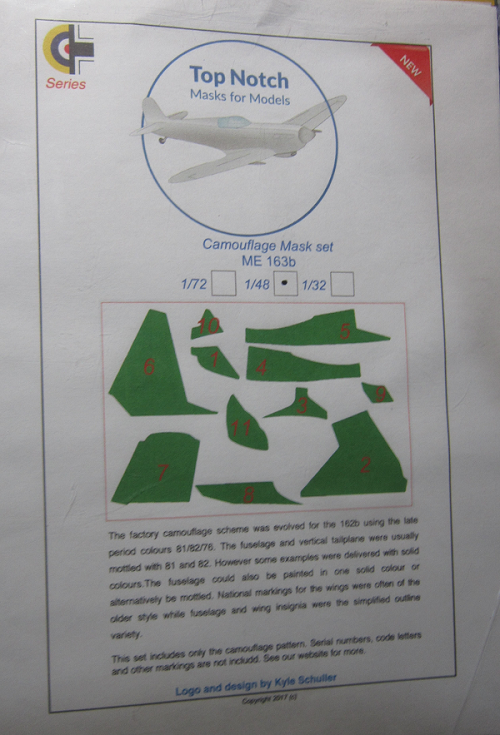 ​There are 11 sections for the splinter camouflage. 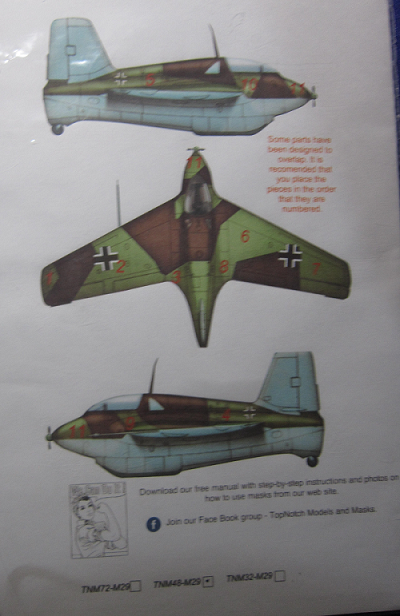 ​On the left side of the instructions is a 3-view of a ME-163B showing its sides and top. Captions tell where to apply the masks.